In an expensive city, people will find all sorts of ways to bring in rental income — and that’s why one Canadian man is offering to build a house on someone else’s property for free. Laird picked up on the idea after noticing an advertisement for leasing out commercial property while sitting in traffic. He’s now looking for someone who will let him build such a house on their property. But instead of money, he wants the owner to give the right to rent out the house for the next 12 years. Duane Laird, in front of a laneway house in Vancouver. The way it would work is this: Laird would find a property owner, make sure the space conforms to the regulations required to add a second house and then draw up a contract that would have him build the house and receive rights to rent it out for the next 12 years. Once 12 years pass, the property owner would receive full control of the house and Laird would either move on to building a similar home on another property or doing something else. Laird has already drawn up a plan for the project on his site and made arrangements with a company that would supply the necessary steel. Vancouver, which has long been identified as having an ‘affordability crisis,’ has seen the average price of a house in its metropolitan area rise 16 percent between 2017 and 2018. As a result, home sales have slowed to the lowest it’s been since 2009 while some locals have tried to make money off of property in collaborative ways. 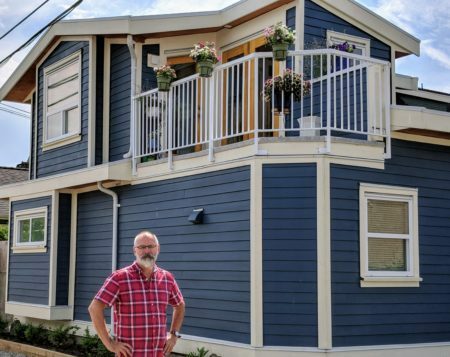 Next week, Vancouver City Council will vote on a plan to improve the affordability of real estate in the area — one of the options the plan outlines includes laneway homes. “This is the way to do it without having to pay for it,” Laird said. He believes his idea can take off between those who do not have property on which to build and those who have it but cannot build a house themselves due to a lack of either money or time. Article image credited to Photo Credit: romakoma/Shutterstock.com.